Kurdistan - Federalism or Independence? The area of northern Iraq inhabited by the Kurds - they refer to it as Kurdistan - is easily the safest part of the country. There are only a few foreign forces stationed there since the area is mostly pacified and under the control of the local police force. The Iraqi constitution allows for the establishment of autonomous regions, and the Kurds are taking advantage of that, having established the Kurdish Regional Government that oversees the three almost homogeneous provinces of Arbil, Dohuk and Sulaymaniyah. Earlier this month, KRG president Mas'ud Barzani banned the Iraqi national flag from public buildings in these provinces, ordering instead the display of the Kurdish flag. (See my earlier Iraq - Replacement of Iraqi flag with Kurdish flag.) Many considered this to be yet another indication that the Kurds intend to establish an independent state. There are other steps that tend to indicate this intention. 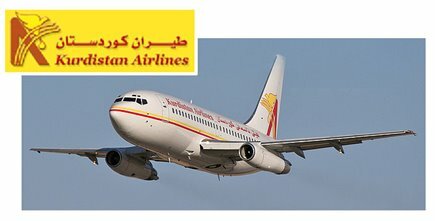 Last year, at least three Kurdish airlines (Kurdistan Airlines, Azmar Airline and Sawan Airline) opened for business, offering direct flights between cities in Europe and the Middle East and the newly refurbished and improved Arbil airport and Sulaymaniyah airport. KRG officials have also made independent deals for oil drilling and oilfield development without consulting or involving the oil ministry in Baghdad. This move is particularly threatening tot he Sunnis in Iraq. If Iraq devolves into a civil war and fragments into three separate enclaves (Kurdish, Sunni and Shi'a), or if a federation is established with three regions, oil revenue will be a critical issue as it is almost the sole source of income for country. If the regions are able to control oil revenues, the Kurds and Shi'a are well-placed, as almost all the oilfields are in the Kurdish are in the north and the Shi'a area in the south. The Sunnis will be cut out of Iraq's most lucrative asset. The Kurds will likely be satisfied with a federal structure as long as they can exercise autonomy in their region. One problem will be the status of mixed areas adjacent to the three Kurdish provinces, particularly Kirkuk and to some extent Mosul. Kirkuk may be contentious as Kurds try to reclaim what they believe is a Kurdish city at the expense of the Turkomen and Arabs. Should Iraq erupt into a civil war, the Kurds may just declare themselves independent. They will not have much a of a problem with the Sunnis or Shi'a - neither are strong enough to take on the Kurds. The question is what will Iran and Turkey do. On September 22, an estimated 800,000 Lebanese - that's almost a quarter of the population of the country - attended a rally in Beirut in support of Hizballah. Hizballah leader Shaykh Sayid* Hasan Nasrallah made his first public appearance since the five-week war between Hizballah and Israeli forces. 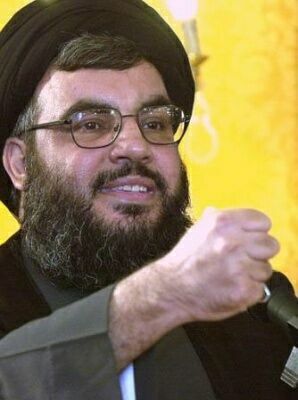 More important than Nasrallah's appearance were his words. Even if his appearance was somewhat of a surprise, his message was not. Despite the fact that he has declared victory over the Israelis, he remains mostly in hiding out of fear of an Israeli attack. There is probably good reason for that. At least one member of the Israeli cabinet has renewed calls for his assassination. As for his message, he reiterated his previous positions. 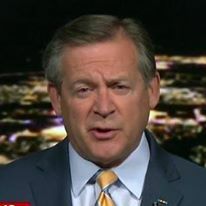 First, he declared that he would not release the two captured Israeli soldiers unless it was part of a larger prisoner exchange for Lebanese held by the Israelis. This is direct contravention of United Nations Security Council Resolution 1701 - quote: "including by the unconditional release of the abducted Israeli soldiers." It gets better. Nasrallah stated that Hizballah would neither disarm nor disband, again in contravention of 1701 - quote: "there will be no weapons without the consent of the Government of Lebanon and no authority other than that of the Government of Lebanon," and "require the disarmament of all armed groups in Lebanon, so that, pursuant to the Lebanese cabinet decision of 27 July 2006, there will be no weapons or authority in Lebanon other than that of the Lebanese State." He went on to say that Hizballah was still in possession of 20,000 rockets. This is a much larger number than Israel believed the militia had in its arsenal. Israeli estimates were that Hizballah had as many as 13,000, and perhaps almost half had been used or destroyed in the conflict. Nasrallah also gloated that regardless of any kind of blockade, Hizballah would still maintain (and no doubt restock) its arsenal. Although 1701 called for Hizballah to withdraw north of the Litani River, Nasrallah's comments left little doubt that he has no intention of complying with this provision either. He implied that international forces should stay clear of Hizballah positions, but did welcome the deployment of the Lebanese Army south of the Litani. That makes sense. International forces may feel compelled to actually enforce the UN resolution, although that would be a marked departure for the ineffective United Nations Interim Force in Lebanon (UNIFIL) that has done nothing since its inception in 1978 except build itself nice facilities and watch Hizballah fortify the area after the Israeli withdrawal in 2000, much as it did with the Palestinian Liberation Organization before that. Worthless is the word that springs to mind. On the other hand, deployment of the Lebanese Army, which is neither willing nor capable of doing much of anything, suits Nasrallah just fine. In his remarks, Nasrallah chided the government of Fu'ad Sinyurah, claiming it is "unable to protect, rebuild or unify Lebanon." He may be right, and no doubt willing to have Hizballah fill that role. Nasrallah and Hizballah have done nothing to comply with UNSCR 1701. Israel has complied by lifting the air and sea blockade and plans to have all of its troops out of Lebanon by Yom Kippur (this year it runs from sunset October 1 to nightfall October 2). Given the apparent reluctance of the Olmert government in Tel Aviv to do anything about it, it appears that Hizballah has emerged in a stronger position than it was in prior to the conflict. Surprisingly, no one seems to care. * Sayid is an honorific title for male descendants of Muhammad. The American embassy compound is shown in the image to the left. It is the triangle in the center of the image. I served at this embassy from 1992 to 1995 as the air attaché. The embassy is not one of the new hardened State Department facilities, but an older large house, two small buildings and a garage facility that have been converted to embassy use. It sits in a crowded urban area. The Chinese and Italian embassies are across the street. There is a blast wall around the compound, as well as reinforced guardrails made of I-beams along the main street, the location of today's attack. Fortunately, the main bomb - a series of pipe bombs wrapped around propane tanks - did not detonate. Four perpetrators, described by Syrian security officials as "terrorists," were killed. The attackers were heard shouting "Allahu Akbar" (God is great, a common Islamic phrase) during the incident. The security situation is Syria and the capital city of Damascus overall is good. The security in this section of Damascus - Abu Rumanah - is very good. 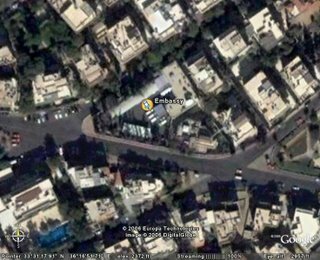 It is home to not only many embassies and diplomatic residences, it also is the home of the family of the late president Hafiz Al-Asad, the Ministry of Foreign Affairs and the Ministry of Defense liaison office (that's where the Syrians managed the foreign attaches). The embassies are protected not only by their own staffs, but by Syrian guards armed with automatic assault rifles as well. That said, there are some risks. The American embassy has been the scene of protests, some even getting violent. During the Gulf War, despite the fact that Syria was part of the American-led coalition, Syrian protesters were able to scale the walls and do some looting. In the late 1990's, the embassy was attacked by an angry mob. There was property damage, but no casualties. In these attacks, you are always wary of the role of the Syrian government. Are these attacks sanctioned to send a message to the American government? Additionally, there was an attack on a United Nations facility in the Al-Mizzih section of the city, but this is believed to be staged to support Syrian claims that it was tough on terrorism. Who is behind today's attacks? The most likely culprit is the outlawed Muslim Brotherhood, the Al-Ikhwan Al-Muslimin. This group has been active in Syria for decades. In 1982, Hafiz Al-Asad sent a Syrian army unit commanded by his brother Rif'at to put down a Brotherhood-inspired uprising in the northern city of Hamah. As many as 40,000 Syrians died in the fighting as Syrian artillery pounded the city into submission. This incident gave rise to the phrase, "Hamah rules" to describe Syria's method for handling dissent. While in Damascus, there were occasional gunbattles between security forces and the Brotherhood - in almost all cases, they had to be killed as they would not surrender. Is there the possibility of Syrian complicity in this attack? Certainly relations between Syria and the United States are tense now. Syria has recently suffered diplomatic setbacks that they attribute to American policy, most notably the Cedar Revolution in Lebanon that forced Syria to withdraw its troops that had been there for 30 years. Associated with that is the withdrawal of the U.S. ambassador; the embassy functions under the leadership of a Charge d'Affaires. In the recent Israel-Hizballah clashes, Syria was accused of resupplying Hizballah - in fact Syria is the almost exclusive conduit for money, weapons and training for the terrorist group. We will never know exactly who did this. To be sure, there will be an investigation with little or no American participation. Someone will be named as the perpetrator and the Syrians will claim the case solved and security tight. Israel Agrees to Lift Blockade of Lebanon??? Israel announced that it will lift its almost eight-week old air and sea blockade of Lebanon on Thursday. This comes a part of a series of steps called for in United Nations Security Council Resolution 1701 of August 14. Israel has been withdrawing its troops from southern Lebanon as Lebanon troops and an augmented United Nations Interim Force in Lebanon UNIFIL)takes up positions in the area. In this case, "interim" is a loose term - this ineffective organization has been in place since 1978 and done little but spend money and build nice facilities for themselves. One has to ask why Israel agreed to lift the blockade. First, its major concerns is the resupply and rearming of Hizballah by Iran and Syria via the long and porous border with Syria. Although UNSCR 1701 (and UNSCR 425 and UNSCR 1559 - is there a pattern here?) call for the disarming of Hizballah, it is obvious that neither the Lebanese Army nor UNIFIL is willing or capable of the task. Lebanese Army officers said they will not disarm their Hizballah "brothers," and UNIFIL says that is not its mandate (why am I not surprised?). Hizballah itself says it will not disarm, stating that the time is not right, and reiterating the worn-out claim that Israel still occupies the Lebanese area known as the Shaba' Farms - which the United Nations and Israel agree is part of Syria. Given this, I would assess that Hizballah will not disarm, nor will it be disarmed. Perhaps Israel believes that it has damaged Hizballah to the point that if it is not resupplied or rearmed it is not a significant threat. Personally, I do not think that is the case - Hizballah still retains a sizeable arsenal of long and medium-range rockets, thousands of which it fired at Israeli cities during the month-long war. It also believes that it held its own with some of the world's best armed forces. Perhaps Israel correctly assesses that maintaining the air and sea blockade will have no effect on Hizballah's status. Syria and Iran do not move weapons and supplies into Lebanon by sea or air - they come overland from Syria, mostly on the Beirut-Damascus highway, which just happens to service the Damascus International Airport. The airport has been Iran's preferred port of delivery to Syria for Hizballah's weapons since 1982. Israel finally bowed to world opinion and pressure from the United States. UN Secretary General Kofi Annan and American Secretary of State Condoleeza Rice assured the Israelis that UNIFIL and the Lebanese Army were in place and ready to prevent the resupply and rearming of Hizballah. Israel wanted international (even UNIFIL) troops on the Syrian border, however Syria stated that the presence of international forces on its border would be considered a foreign "occupation" of Lebanon and would be "resisted." Thus, we have the pitiful Lebanese Army on the border where it counts - the same troops who do not want to disarm their Hizballah "brothers." To dispel our doubts about the Lebanese Army, Syria claims to have beefed up security on its side of the border. Really? These are the people that have in the past trained and supplied Hizballah, and allowed the Iranians to do the same from their territory. So, now Israel has agreed to withdraw from southern Lebanon despite the fact that Hizballah will not disarm and will not be disarmed, it has agreed to lift its air and sea blockade of Lebanon while the Lebanese Army and Syrian troops guard the overland resupply routes, and agreed that the two captured Israeli soldiers - the reason this all began back on July 12 - really don't have to be released unconditionally, but might be part of a prisoner swap after all. Who's in charge in Tel Aviv and what are they thinking? The president of the Kurdistan Regional Government, Mas'ud Barzani, ordered that the Iraqi national flag be replaced by the Kurdistan flag in the autonomous region of northern Iraq. This order comes at a time when increasing sectarian violence has raised the specter of a civil war. Iraq's Kurds have always yearned to be independent. In the early to mid-1970's, they waged an unsuccessful rebellion against the Iraqi government. They were supported in this rebellion by Iran and the United States (at the request of Iran). In the early 1980's, Saddam Husayn agreed to the formation of the Kurdish Autonomous Region as promised in 1970, but never really allowed it. In 1987 and 1988, Saddam ordered the Iraqi armed forces to attack the Kurds, including chemical weapons attacks, in a campaign known as "the Anfal." Saddam is now on trial for crimes against humanity in this campaign. The Iraqi constitution allows for the formation of autonomous regions - the Kurds have taken advantage of this provision. The constitution does not allow for secession from the republic, which is what many fear the Kurds are planning. The Sunnis are concerned that an autonomous Kurdish area in the north might control the northern oilfields, while a Shi'a region in the south would control the southern oilfields, leaving the Sunnis with no oil resources. I am a big supporter of the Kurds, having served with them in northern Iraq in the 1990's as part of the Iraqi opposition. Should Iraq devolve into a civil war, the Kurds will likely try to declare an independent Kurdish state. That will certainly raise problems with neighboring Iran, Turkey and Syria, all of whom have Kurdish populations and have stated they will not tolerate an independent Kurdistan. The flag of Kurdistan was first introduced by the Kurds in their struggle for independence from the Ottoman Empire in 1920. The sun disk has 21 rays and the number 21 has a primary importance in the native Yazdani religious tradition of the Kurds.